The forward anchor locker includes a rattle-free secure locking cradle. 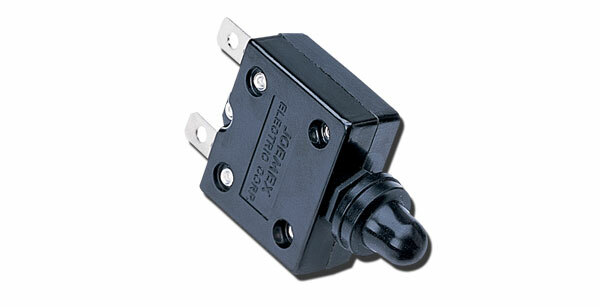 A safety minded eight pound anchor is available as optional equipment. 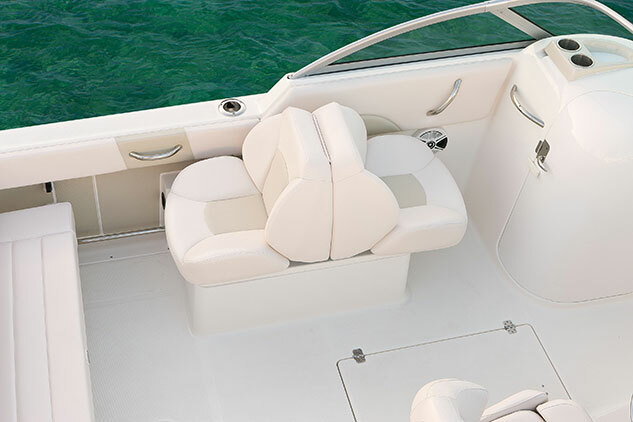 The adult sized bow area features wraparound seating and well padded backrest cushions. 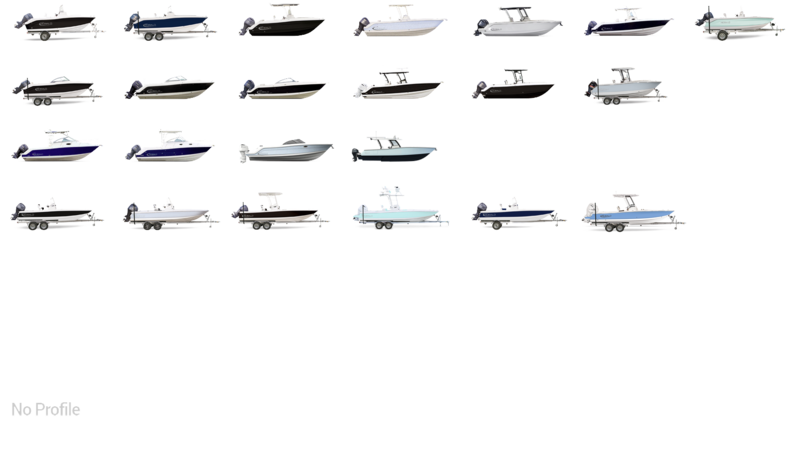 Stainless steel grab rails are accessible both from inside the boat and the dock. 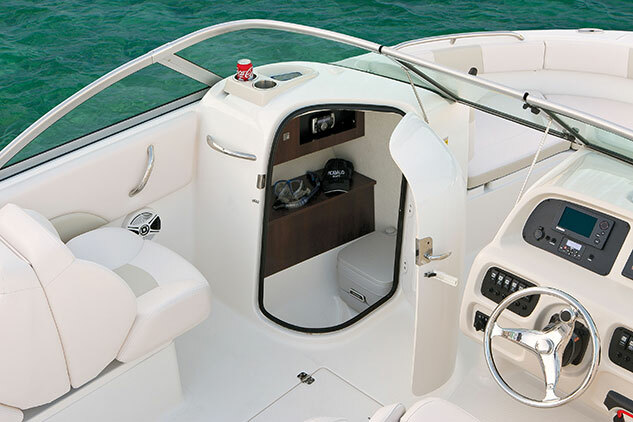 Flush mount latches reveal fiberglass lined bow storage compartments. The insulated forward ice chest drains overboard. The best helm ergonomics you'll find at this length include a non-glare helm, bucket seats with a flip-up front cushion and a molded kick panel. Inside the head you'll find directional lighting, maple cabinetry, a mildew resistant headliner and a locking door. A porta-pottie is standard with Vacuflush options available. 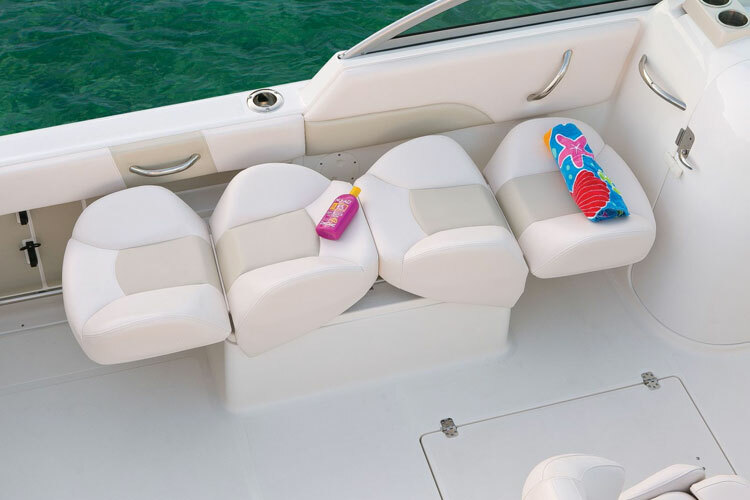 A comfortable back-to-back passenger's seat converts into a reclining chaise lounge. 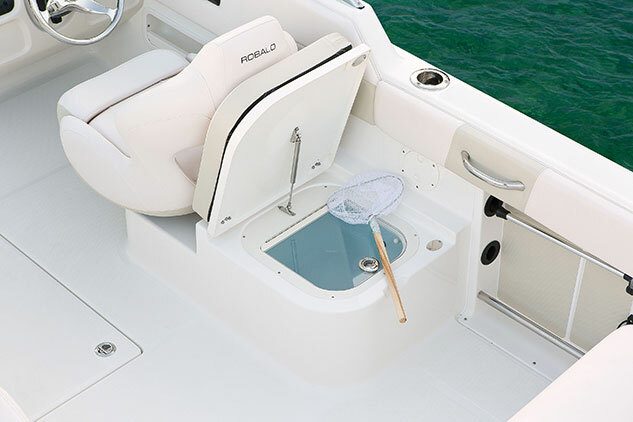 In addition to the two forward bow fish boxes, there's an insulated storage locker under the lounge seat. Positioned behind the adjustable captain's chair, the 20-gallon livewell features LED lighting and a blue gelcoat finish for longer bait life. Note the stainless steel grab handle and gunwale rod storage. 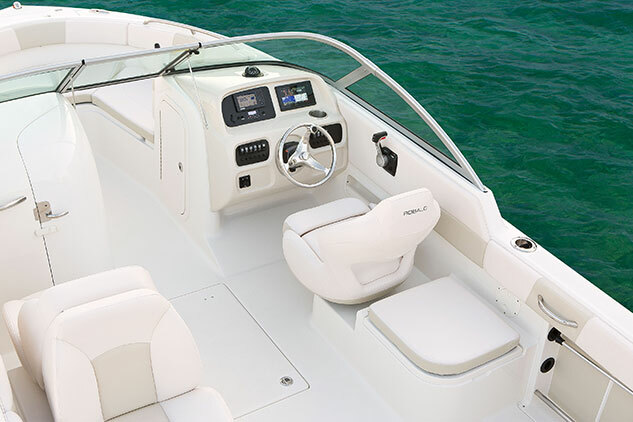 You'll enjoy the added seating capacity and legroom possible with the optional aft facing seat. Snap-in carpet is also optional. 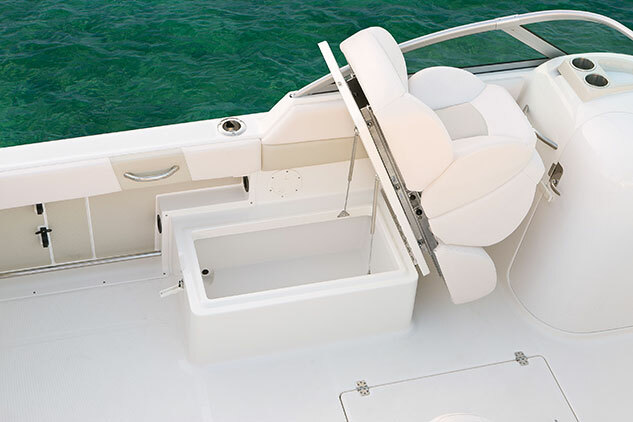 Position the optional aft seat out of the way for complete transom access. Add in richly padded coaming panels and secure Diamond Lustre non-skid and you've got the ideal setup for fighting fish or watersports. 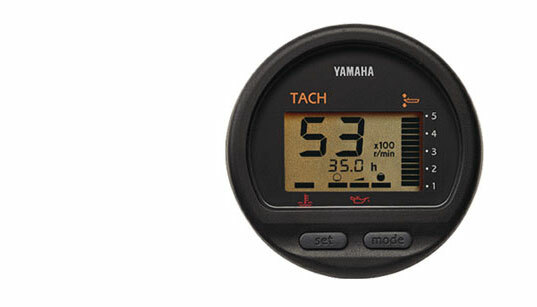 It's never a knuckle-buster gaining access to all rigging and onboard systems. 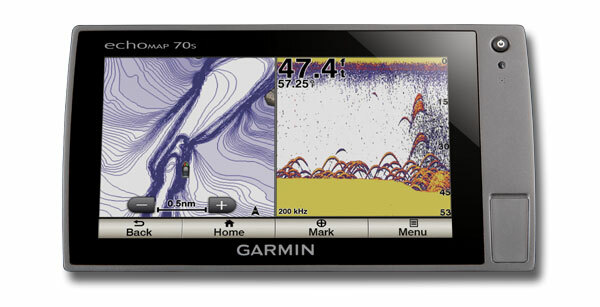 An optional ski tow pylon changes the fishing-minded R227 into a first-rate tow machine.